Hydrogen is a well-kept, renewable, carbon-neutral, and energy-efficient fuel which is presently being produced entirely with the reformation of fossil fuels. But to be effective and utilizable at an industrial scale, certain issues from economically and environmentally sustainable production point of view still needs clarification. Species range from photosynthetic fermentative bacteria to green microalgae and cyanobacteria have the capacity to produce hydrogen. Producing hydrogen biologically represents a possible channel for the sustainable generation of hydrogen over a large scale, required to fuel a hydrogen economy in near future. Biological processes compared to conventional or physical production methods manifest various edges while conducting at ambient pressure and temperature conditions, without using precious metals for catalyzing reactions. Producing hydrogen biologically is a promising route from an environmental friendly viewpoint. Photobiological hydrogen production is examined as one of the promising technology and started to become a mature technology with significant advances in substituting energy derived from fossil fuels. Withal, the chief bottleneck while developing a practical approach is the low yield associated with it, approximately around 25%, which is comparatively well below from the production of other biofuels with the use of same feedstocks. 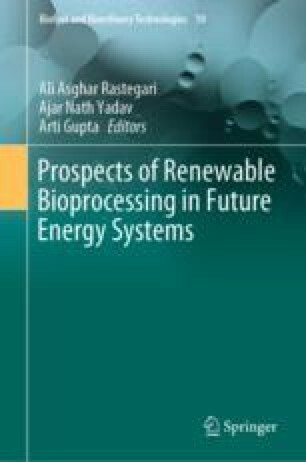 This chapter introduces the microorganisms for the biohydrogen production, production processes, and types of photobioreactors for the production of hydrogen following certain challenges that exist in this very particular area along with the environmental and economic analysis of the same. I thankfully acknowledge Professor Sanjeev Puri for trusting in me and bestowing me this lucky chance to explore and gain knowledge and excel.